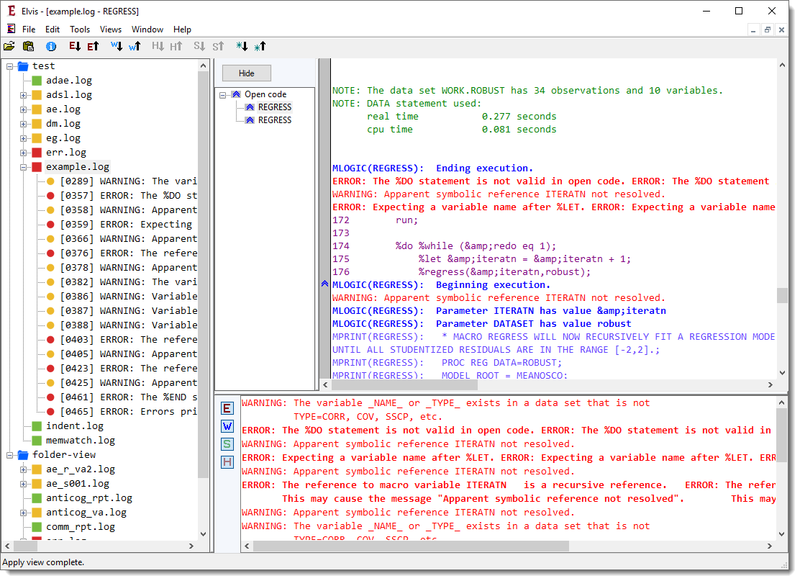 Elvis takes a SAS log, either from the clipboard or from a saved file, and allows you to view it, navigate around it, search it and more, which makes working with large SAS logs much, much easier and faster than simply looking at the log in a non-specialised viewer such as a plain text editor, Internet Explorer or Notepad. Elvis also works with logs produced by the World Programming System (WPS). 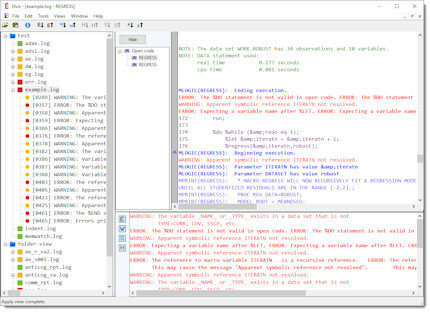 Reports, summarising important log information: recover runnable SAS source from MPRINT lines, summarise all called macros, etc. 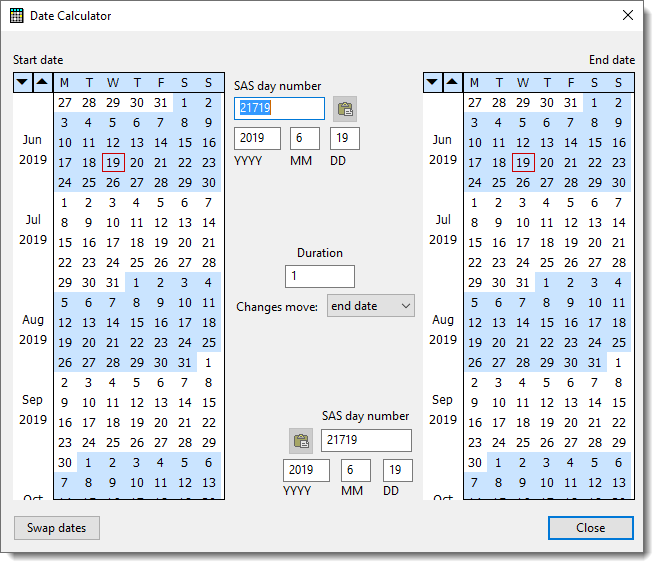 Now includes SAS Date Calculator, an intuitive, graphical way to convert between numeric SAS date values and real dates, and to calculate date ranges. See the demo here. This file is a full installation program; once downloaded, simply double-click the file to run it and you'll be guided through the installation procedure. Elvis does not require .NET, Java or any other runtime support. During installation of Elvis, you will be required to read and accept the End User License Agreement (EULA). The EULA for Elvis is also available here, if you'd like to read it before downloading. This is a completely free trial version of Elvis, so you can download it and try it out with no outlay. The free downloadable version below will only read the first 800 lines of each log - to unlock the full power of Elvis, you will need to buy a registration code. For a single user, this costs just US$49 through our payment partner MyCommerce; please enquire for multi-user and academic discounts. From the Start menu (or Start screen, on Windows 8/8.1/10), select the Control Panel, then select 'Uninstall a program' (or 'Add/Remove programs' on Windows XP). Select Elvis in the list of installed programs, then click 'Uninstall'. A detailed web-based User Guide is available here - it will open in a new window. The usage log file is stored in <user folder>\AppData\Local\Oceanview Consultancy\Elvis and you can view this at any time if you'd like to see what data is being collected. Usage logging is automatically enabled when Elvis is installed but you can change this at any time using the Preferences dialog. Version 2.0 released 2016-04-22: A major overhaul, modernising the look and feel for Windows 10 and adding a Recently-Used Files menu. Elvis will now automatically offer to reload your logs if they have changed on disk, streamlining the modify-program/run-program/check-log cycle. Version 1.6 released 2011-12-21: Some bug fixes. Elvis is now built with Microsoft Visual Studio 2010 - this means it will no longer work with Windows 2000 or earlier. Version 1.5 released 2008-11-07: The Quick Find pane now displays lines colour-coded in the same way as the main log window. Improved load times and scroll-bar handling for large logs (>60,000 lines). Fixed some bugs to do with unbalanced macro Beginning / Ending lines. 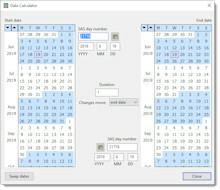 Version 1.4 released 2008-03-02: The major new addition is the Date Calculator (see above, or the User Guide). Elvis now also includes drag-and-copy functionality from the main Log Window, including immediate creation of a new Highlight term from the right-click menu. Version 1.3 released 2007-03-07: Logs without MPRINT lines are now handled correctly; macro calls that follow each other without any intervening lines are now handled correctly when loading a new log. Version 1.2 released 2007-02-01: Instant online Elvis registration now available via RegNow; new 'SAS source' report recovers runnable, formatted and indented SAS code from the MPRINT lines in your log; Elvis will now handle logs with the Version 9 'MPRINTNEST' option switched on; improved cross-platform detection of source lines. Version 1.1 released 2006-04-09: This production version includes some changes to trial-only features of Elvis, including a nag screen, and is the first version to have a full-featured installer. Several minor updates to the formatting and layout of some dialog boxes are also included, and a new built-in view "MPRINT only" has been added. Version 1.0 released 2006-01-22: First production version; incorporates several bug fixes and finalises the behaviour of the macro call show / hide functionality when MLOGIC lines are not being shown. Version 0.9b released 2005-12-11: Addition of reporting functionality - this release includes a single report showing all macros called in a log along with their autocall locations; F3 / F2 keypresses now move to next / previous of all lines of interest, not just highlighted lines; bug fix - a macro call immediately following another ('Ending execution' followed by 'Beginning execution' on consecutive lines) will now be recognised correctly. Version 0.8b released 2005-10-01: Addition of new 'any line of interest' toolbar buttons; updated 'jump to first ERROR' option on opening a log to allow jumping to the first ERROR, WARNING, special-prefix line, highlighted line, or the first of any of those types. Version 0.7b released 2005-09-18: Some bug fixes; highlighting/searching now optionally case-sensitive; improved usability of Highlighting dialog; increased line limit in demo version to 3000; added highlighted lines to the Quick Find pane; added option to jump to first ERROR: on opening a log.